Married, wife's name is Karla...The couple has a daughter, Marcela...Originally signed by the Toronto Blue Jays as an international free agent on January 2, 2008. Acquired by the Atlanta Braves from the Los Angeles Angels in exchange for INF Ryan Schimpf on 3/31...Claimed off waivers by the Texas Rangers on 5/2... Hit .305 (29-for-95) in 26 combined minor league games between Double-A Frisco and Triple-A Round Rock... Batted .143 (10-for-70) in 28 combined major league games between Atlanta and Texas. Appeared in 11 games with the Angels across two stints after spending a majority of the season with Triple-A Salt Lake ... Tallied second career walk-off hit Apr. 11 with an RBI squeeze bunt ... Led the Bees with a .352 average while his 92 hits ranked fourth by a PCL catcher. In second season with the Angels, improved in nearly every off ensive category over rookie campaign including runs, doubles, home runs, RBI and games...Finalist for the Rawlings Gold Glove Award at catcher (won by KC's Salvador Perez)...Posted a 37.5% (21/56) caught stealing percentage, good for third by an A.L. catcher (min. 650 inn. )...Went 5-for-6 with two doubles, a home run and six RBI July 2 at Fenway Park...Joined Kendrys Morales, Chone Figgins, Mo Vaughn and Dave Winfi eld as the only Angels with fi ve hits and six RBI in a single game...Outi ng was just the fourth six-RBI game by an Angel backstop in franchise history and fi rst since Jeff Mathis, July 23, 2008 vs. Cleveland...The fi ve hits marked just the fi ft h such occurrence in franchise history by a Halo backstop...Was the team's Opening Day catcher. Saw first big league action of career, batting .250 (65-for-260) with 13 doubles, four home runs and 21 RBIs in 86 games with the Angels... Hit .333 (25/75) with five doubles, a home run and five RBIs over his final 23 games of the season... Lifted average from .216 to .250. Posted a 37.9% (18-for-59) caught stealing percentage, good for third in the American League (min. 70 G). Began the season with Triple-A Salt Lake prior to call up to the Majors May 4... In 17 games with the Bees, hit .361 (26-for-72) with eight doubles, two home runs and 12 RBIs. Made Major League debut May 5 vs. Seattle, going 2-for-4 with a home run and an RBI, including a walk-off home run in the bottom of the ninth… According to STATS, is the fourth player all-time to hit a walk-off home run during debut, joining Florida's Miguel Cabrera June 20, 2003 vs. TB, Cleveland's Josh Bard, Aug. 23, 2002 vs. SEA and the Angels' Billy Parker, Sept. 9, 1971 vs. Milwaukee... Became the 26th Angel all-time to homer in first game with the club and just the sixth to do so during M.L. debut... First big league hit was a single to center in first at-bat. Spent season with Houston's Triple-A Oklahoma City, posting a .259 (78/301) clip with 16 doubles, two triples, six home runs and 34 RBI...The six homers were a minor league career-high...Appeared defensively in 74 games at catcher for the RedHawks and five at first base...Made first professional appearances at first base...Threw out 22 of 68 would-be base stealers (32%) which ranked fifth among qualifiers in the Pacific Coast League...Hit .276 (32/116) after the Triple-A All-Star break, compared to a .249 (46/185) clip in the first half...Posted a .338 (24/71) clip in 21 games in July...Acquired by the Angels from the Astros Nov. 5, 2014 along with RHP Nick Tropeano in exchange for C Hank Conger. Entered the 2013 season as the Astros No. 17 prospect and the top catcher in the system as ranked by MLB.com...in 91 combined games between Triple A Oklahoma City (75g) and Double A Corpus Christi (16g), hit .271 (86x317) with 18 doubles, three homers, 37 RBI and a .332 on-base percentage...began the year at Double A before reaching the Triple A level for the first time in his career on May 1...threw out 46.7% of runners attempting to steal (35-for-75)...threw out more runners (35) than any Pacific Coast League catcher despite playing the first month of the season at Double A...hit .300 (51x170) off righties at Triple A. Combined to hit .285 (103x361) with 28 doubles, five home runs and 50 RBI in 97 games behindthe plate for Class A Lancaster (26g) and Class A Lansing (71g)...began the season with Lansing beforebeing acquired by Houston on July 20...started a 2-4-3 triple play on May 15 while with Lansing...after hisacquisition, was promoted from low A to the advanced A level at Lancaster...threw out 14 of 30 attemptingbasestealers while with Lancaster. Spent the entire season at Lansing (Low-A) of the Midwest League... NOTABLE: Had a career high 26 extra base hits, however his .256 average and .675 OPS were career lows... Was his first season playing more than 66 games... BEHIND THE DISH: Caught 89 of his 95 games played... Made 14 errors for a .982 fielding percenatge and threw out 29% of potential base stealers (46-160)... Batted .305 (25-82) when leading off an inning... WINTER BALL: Appeared in two games (no at-bats) in the Venezuelan Winter League. Followed up the R. Howard Webster Award honour with a third consecutive at Auburn (Short Season-A), winning his first with the Blue Jays DSL club in 2008 as well... Becomes only the fourth Blue Jay to win three Webster Awards (Delagdo, Lopez, Lind)... Led the club in average and on base percentage... Threw out 36% of potential base stealers. Earned an R. Howard Webster award as the Most Valubale Player with Blue Jays Gulf Coast entry... Led the club in average, on base and slugging... Batted .290 vs. lefties and .291 vs. righties... Threw out 49% of potential base stealers. Batted .306 with 12 extra base hits and 52 walks, earning him the R. Howard Webster Award for the DSL Blue Jays. January 25, 2019 C Carlos Perez assigned to Norfolk Tides. January 8, 2019 Baltimore Orioles signed free agent C Carlos Perez to a minor league contract and invited him to spring training. November 2, 2018 C Carlos Perez elected free agency. November 2, 2018 Texas Rangers sent C Carlos Perez outright to Nashville Sounds. August 25, 2018 Texas Rangers selected the contract of C Carlos Perez from Round Rock Express. August 7, 2018 Round Rock Express activated C Carlos Perez from the 7-day disabled list. July 22, 2018 Round Rock Express placed C Carlos Perez on the 7-day disabled list. July 16, 2018 Texas Rangers sent C Carlos Perez outright to Round Rock Express. July 16, 2018 C Carlos Perez roster status changed by Texas Rangers. July 5, 2018 Texas Rangers sent C Carlos Perez on a rehab assignment to Round Rock Express. June 28, 2018 Texas Rangers sent C Carlos Perez on a rehab assignment to Frisco RoughRiders. May 3, 2018 Texas Rangers activated C Carlos Perez. May 2, 2018 Texas Rangers claimed C Carlos Perez off waivers from Atlanta Braves. April 27, 2018 Atlanta Braves designated C Carlos Perez for assignment. April 2, 2018 Atlanta Braves recalled C Carlos Perez from Gwinnett Stripers. April 1, 2018 C Carlos Perez assigned to Gwinnett Stripers. March 28, 2018 Los Angeles Angels designated C Carlos Perez for assignment. November 5, 2017 C Carlos Perez assigned to Leones del Caracas. September 1, 2017 Los Angeles Angels recalled C Carlos Perez from Salt Lake Bees. May 25, 2017 Salt Lake Bees activated C Carlos Perez from the 7-day disabled list. May 19, 2017 Salt Lake Bees placed C Carlos Perez on the 7-day disabled list. Right quad strain. April 19, 2017 Los Angeles Angels optioned C Carlos Perez to Salt Lake Bees. August 17, 2016 Los Angeles Angels recalled Carlos Perez from Salt Lake Bees. August 10, 2016 Los Angeles Angels optioned C Carlos Perez to Salt Lake Bees. July 23, 2016 Los Angeles Angels recalled Carlos Perez from Salt Lake Bees. July 9, 2016 Los Angeles Angels optioned C Carlos Perez to Salt Lake Bees. May 4, 2015 Los Angeles Angels recalled Carlos Perez from Salt Lake Bees. April 4, 2015 Los Angeles Angels optioned C Carlos Perez to Salt Lake Bees. January 3, 2015 C Carlos Perez assigned to Aguilas del Zulia from Leones del Caracas. November 3, 2014 Houston Astros selected the contract of C Carlos Perez from Fresno Grizzlies. 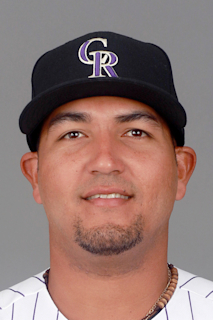 January 14, 2014 Houston Astros invited non-roster C Carlos Perez to spring training. October 9, 2013 Carlos Perez assigned to Leones del Caracas. May 1, 2013 Carlos Perez assigned to Oklahoma City RedHawks from Corpus Christi Hooks. April 1, 2013 Carlos Perez assigned to Corpus Christi Hooks from Lancaster JetHawks. January 17, 2013 Houston Astros invited non-roster C Carlos Perez to spring training. January 20, 2012 Toronto Blue Jays invited non-roster C Carlos Perez to spring training. December 8, 2011 C Carlos Perez assigned to Leones del Caracas. April 2, 2011 Carlos Perez assigned to Lansing Lugnuts from Bluefield Blue Jays. June 18, 2010 C Carlos Perez assigned to Auburn Doubledays from GCL Blue Jays. June 23, 2009 Carlos Perez assigned to GCL Blue Jays from DSL Blue Jays. January 2, 2008 Toronto Blue Jays signed free agent C Carlos Perez to a minor league contract.